Welcome to the end of July. And like every other woman with offspring and a pulse, that gung-ho beginning-of-summer rockstar mom attitude is packed away with my desire to remember what it was like to not feel a trickle of sweat down my spine while sitting at my laptop before 9am. At the beginning of the summer, I did all of those things like make homemade popsicles with Landry and make homemade “blue goo” and put grapes in the freezer and planned play dates and cooked – with actual heat – lunches every day and sweet baby Jesus, it is Seventh-Circle-of-Hell hot in Texas and what did we do to piss off Mother Nature like this? Now it’s cutting the top off those sugar, food coloring, and more sugar tube push-up thingies, wishing the pool was part ice machine, and hey – how’s the weather in Wisconsin this time of year? Life was easier when it was only a toasty 2000 degrees outside. I spent plenty of summers eating those sugar, food coloring, and more sugar tube push-up thingies and I turned out okay-ish. But I gave in and cooked tortilla pizzas for lunch again. Last year, I’d make a couple extra and stick them in the fridge. The next morning, I’d cut them into 4 pieces and send them in her school lunch. And she thought I was the greatest thing since pizza for lunch. But really, this time it was because that one green tomato was going to turn orange in 24 hours. And I was just going to stand at the open fridge, shamelessly eating that leftover pimento cheese with a fork. So why not try to get a little of that beginning-of-June motivation back? 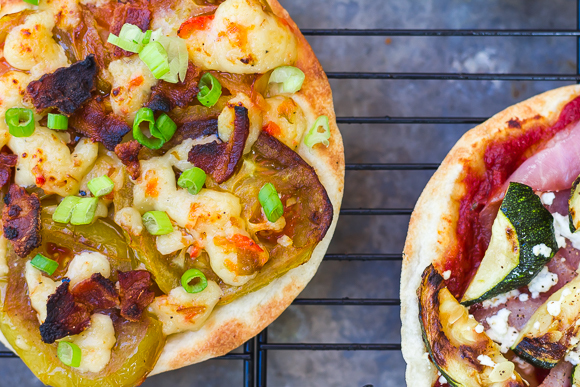 Tortilla pizzas are insanely, barely-a-recipe easy – but they do require use of your broiler which might make you hate me right now. It’s okay – I kind of hate me, too. You toast up one side to make a crispy bottom, flip it, top it, and toast it until the cheese melts. What you put on the top? Your call. The Green Tomato-Pimento Cheese-Bacon tortilla pizza was the real rockstar here. I’ve made this combination in large pizza form and it. is. amazing. And bonus, I didn’t have to plan ahead at all for the dough. Which is great because just hours before it turns Back-to-School August, there is zero planning going on here. 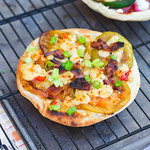 A quick and easy lunch or dinner tortilla pizza made with green tomatoes, pimento cheese, and bacon. Chop the bacon and cook it to a crisp and then transfer it to a paper towel-lined plate to drain. Place the tortillas directly on the top oven rack for 30 seconds to 1 minute until they are lightly browned. 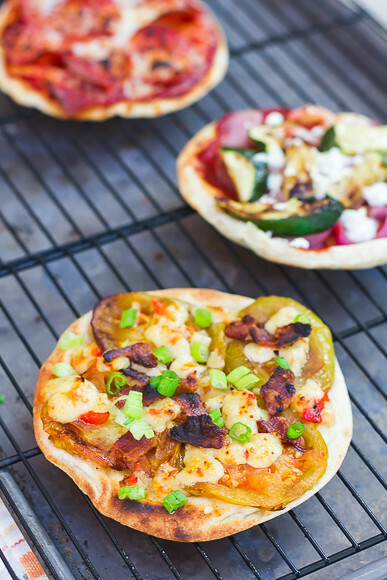 Remove from the oven, flip so that the browned side is now the bottom, and top with green tomato slices, bacon, and ~3 Tbsp of pimento cheese per pizza in small dollops. 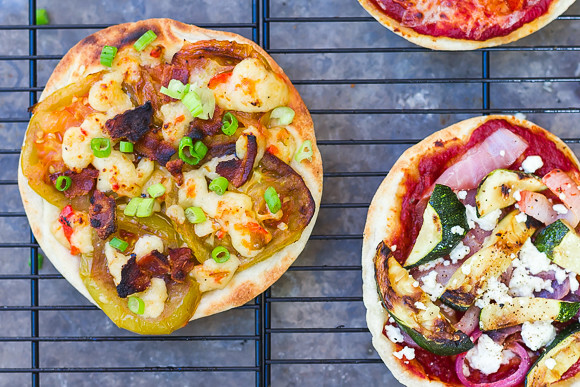 Place a baking sheet on the second rack of your oven (to catch any casualty toppings) and transfer the tortilla pizzas back to the top rack. Broil for ~1 minute until the cheese is bubbly. Remove from the oven, top with green onions, slice into quarters, and serve. Or my preferred method: fold like a taco and inhale.